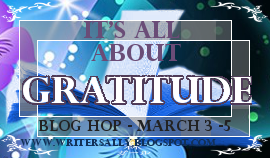 S.A. Larsen, Award-winning author of middle grade & young adult fiction: Is Gratitude Relative? A month ago, I asked a group of writers to ponder the questions: How happy do they feel on a daily basis and How often do they consciously think about it? Then, I invited them to join me in watching a video that explored the idea of gratitude. I asked them They were instructed to watch the video once every day and note the effects, if any, it had on them over the course of a month's time. Between March 3 - 5, they were to share their findings with us. Feel free to visit the other participants and see what they discovered about gratitude in their lives. The video--found HERE--asks us the ponder whether or not there are steps we can take to learn to be in a state of constant happiness - gratitude. But that begs us to answer the question of what happiness really is. When am I most happy/grateful? Why am I most happy/grateful? Do I find slivers of gratitude and happiness during trials? How do I see negatives in my life? By formal definition from Dictionary.com, gratitude means the feeling of being grateful. Well, that's specific. From watching the video along with my experiences over this past month, I'm going to try and give gratitude a more specific definition. 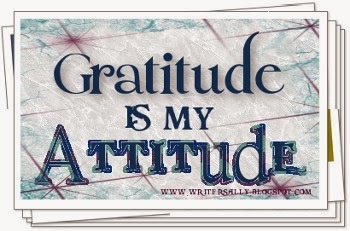 The essence of being grateful, thankful, or happy is all about attitude. It's about how I perceive the world around me and how I interact and react to events, instances, words, and happenings that are beyond my control. In other words, gratitude is a choice. It doesn't hang on what's happening to me or the world around me. Bad things happen to good people. We all know that. Nature keeps balance in ways we may not understand, like the death of a loved one or another lose that couldn't have come at a worse time. Choosing to be grateful despite negatives in our lives gives us power: power to forge ahead and power to be an inspiration to someone else. Just this past week I attended the funeral of a friend's twenty-two-year-old son. Talk about the realm of negativity - a parent losing a child. Who would blame them for being anything but bitter? But they weren't. Several family members stood to speak at the end of the service. Not one of them dwelled on the obvious fact that this young man's life was tragically cut short. Instead, each focused on what he had brought to their lives and to the world. They rejoiced in who his was and still is. They CHOSE to be grateful for the time they had with him instead of clinging to the new hole in their world now that he's gone. Let me share a quote with you that I read over morning. You attract what you are, not what you want. So if you want it, reflect it. Brilliant, is it not? Meditating on what that statement truly means has made a huge difference in my life. It's washed away all my distractions--stripping away the layers of onion peel so I can see what's important. And what are my distractions? For the most part they are negatives in my life I perceive as obstacles. But those obstacles can be easily washed away if I stop focusing on them. Focusing on them only gives them power. Let me ask you this: Wouldn't that power be put to better use on a positive in my life? (You bet.) In your life? My first Act of Random Gratitudeness is to offer my participants and all of you this little badge I created as a gift. ((Hugs)) I've included two sizes for your convenience. Copy it. Paste it on your site, your desktop, or wherever. Share it on social media or keep it private. It's my gift to you. I hope it helps remind you on a daily basis of just how cool you really are. SPLAT: Don't forget to ENTER the KINDLE FIRE giveaway I'm a part of, where TWO Kindle Fires are up for grabs. Thank you for hosting this blog hop. Gratitude is a great step towards happiness. I don't think I've answered all your questions - perhaps I got too involved in the video? Thanks also for the 'Gratitude' gift badge. I'll feel proud to have it on my blog. I was sorry to hear about your friend's son. It's very hard to lose a child so young, and she must be devastated. I hope she has faith. I have had this experience in my life and having a strong faith helped me through. Blessings to your friend. What you've said is so true, Sheri. Bad things do happen to us all at various times of life. But our attitude is everything. Love your badge. My post goes up on Wednesday, just so you know. Positive is so much better. We do attract who we are. Sorry about the loss of your friend's son. They handled it with grace. They really did. It was so amazing. I don't think I've ever attended a funeral (especially of a younger person) and felt so much peace. Haha! LOVE that! I should have known you'd get all clever on me. This is a great idea for a blog hop! Being positive is so much better—and healthier. My best friend also lost her son at 20. Years later, she still struggles. Life is hard and joyful. For me, faith and God get me over the treacherous mountains. We all need more gratitude, for life in also a gift. Use your Gifts wisely. 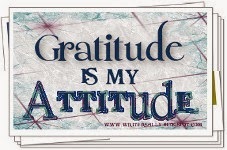 If one is really being balanced about gratitude, it should include why you are grateful for slips and "failures" too. A basic Zen principle is what you put out into the universe returns to you. Great Hop, Sheri! Love this! Gratitude is key to a lot more than we realize. I strongly believe in finding the good when logic says there is none. But it is. It's always there if you look. Thanks for the reminder! You are so right. Gratitude IS the key to more than we image. Love this post. Gratitude is such an important thing and I try to practice it everyday, although it can be tough sometimes when your day just isn't going right. There's always something to be thankful for. BTW, I nominated you for an award on my blog. :D hugs! Thank you for the kind words about my friend. I'm not sure if it's because I'm getting older, but it seems like more and more of these tragedies are occurring. Aw, and I am so grateful for you, too! Lovely post, Sheri. Our attitude is so important. It's human nature to be temporarily down about bad things that happen, and it takes resilience to bounce back. But bouncing back from a serious illness myself (and having a son who survived cancer) helped me see what's important in life. I don't get anywhere near as upset about things as I used to. It always amazes me how strong our human will can be when we let ourselves go. Thankful that you and your son have survived bouts with cancer. (My dad was recently diagnosed, and almost every family member of my mom's past away from it.) You truly are inspirations! Thank you for visiting and sharing your thoughts. Very nice post. It put a smile on my face. Thanks for the buttons. So happy to know it put a smile on your face. (I really needed to hear that, today.) Thank you! What clever badges! Thanks for sharing the story about the poor family who lost their son way too soon. If they can dwell on celebrating their son's life, I have nothing to complain about. I have mild depression so while I'm not necessarily happy all the time, I am grateful all the time! Not a day goes by that I'm not grateful for all that I have (my family, a roof over my head, having enough to eat, not having to work so I can homeschool the kids, etc). Your friends who lost their son are so strong and inspirational. Everyone should have that attitude! A guy I went to high school with died yesterday of a heart attack. He was 42. I've been dreading going to get my taxes done, but I keep thinking today--I should be grateful that I'm alive to do taxes. We take so much for granted! I had a near-death experience when I was 29 years old. Twelve years later, I try hard to not take anything for granted. Even when things don't go my way, I'm grateful for the learning opportunity to learn from my mistakes or take the "bad stuff" in stride. Oh, gosh! Glad you're okay. It's awesome you've seen that experience as a new way to look at life. Good for you! 2014 hasn't been an easy year so far in my real world but it's so much better to focus on what we have and can do than the other way around! An enlightening post. Thank you, Sheri, for the reminder to be thankful for what I have even when life gets tough. Love the badges. Will add them to my blogs. Glad you like the badge! Thank you, Beverly. Thank you for sharing it! Hope it helps some folks remember to focus on the positives. God knows I need that reminder daily. Great idea! We definitely need more gratitude in life. I've been trying to make that my motto for the year of 2014. Gratitude is so important in our lives. We should definitely acknowledge the wonderful people and blessings we have. What a wonderful idea to host this blog hop! We ALL need to be reminded to have a little more gratitude in our lives. I have loved "meeting" you in this writing/blogger world, and I'm grateful for YOU. For your kind encouragement and kindred spirit. Great blog hop. Gratitude is indeed underrated. Sad about your friend's young son. Love the idea for this hop. A pity I didn't know about it sooner, otherwise I would have certainly participated. Have a lovely week. My post is up!! Thank you, thank you for hosting this wonderful idea and I love your thoughts on it. You attract who you are, that is so true. We have to have the right attitude first, before anything else. When I have a grateful attitude, I feel like magic happens. Seriously! Oh my goodness, I can't even image going through that as a parent. Wow. Yes, we must appreciate each day and all its gifts. Thanks for hosting this amazing hop so that we all remember to focus on what's important: gratitude. Thank you so much for the lovely gift and this blog hop! Ooh...that quote gives me chills. Definitely going to have to borrow that one! I love that quote. What a powerful perspective. Thanks for sharing it.